Probably the quickest method of drilling boreholes through ice is to use a continuous, high-pressure jet of hot water. Although this method does not result in the recovery of an ice core, which could be analysed for its physical and chemical properties, it (i) requires substantially reduced logistical support, (ii) is an order of magnitude faster than mechanical coring, and (iii) results in a borehole that can still be used to install experiments to investigate both within the glacier (the englacial zone) and at the ice-bed interface (the subglacial zone). 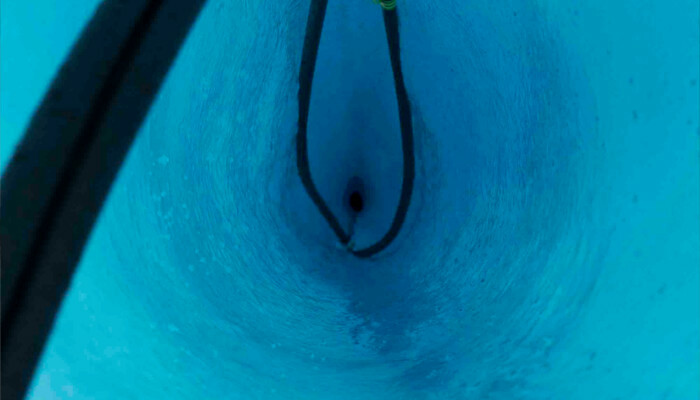 The principle of hot water drilling involves lowering a heavy cylindrical stem tipped with a high-pressure nozzle through the ice at a rate such that the the jet always melts the ice front ahead of it, with the nozzle itself never touching the ice. In this way, the stem hangs as a pendulum allowing boreholes to be drilled within a couple of degrees of vertical. To reach the bed, RESPONDER’s boreholes need to be ~1,000 – 1,300 m long, requiring a substantial supply of hot, pressurised water. To achieve this, we pump meltwater out from water-filled crevasses into an intermediate storage tank. Water is then supplied from the tank to four pressure-heater units, which are plumbed in parallel. The units we use for RESPONDER are in fact adapted commercial pressure washers, manufactured by Kärcher. The resulting ~60 L per minute of water at a temperature of ~70°C and a pressure of ~110 bar is fed through a manifold to the main hose. This hose, which is ~1,350 m long, is fed from its main spool to a motorised sheave wheel over which it passes in order to control and record its descent into the glacier. Depending on the borehole diameter required, boreholes for RESPONDER can take anywhere between 10 and 40 hours to drill from the surface to the bed. 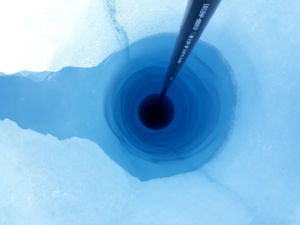 When a borehole finally intersects the ice-bed interface, water within it generally connects with the subglacial drainage system and the borehole water level drops rapidly to equilibrate to the pressure within that system. 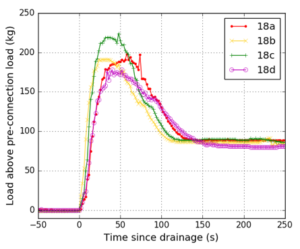 We record these connection events via load cells mounted on the axle of the sheave wheel, indicating a dramatic increase in load during drainage (largely accounted for by frictional stress on the hose as the water drains past it) and a return to a higher load following equilibration than before connection (reflecting a reduction in buoyancy due to the new, lower borehole water level). Once drilled, boreholes may be logged by, for example, optical televiewer and used for the installation of sensor strings designed to measure properties such as englacial temperature and tilt and subglacial temperature, water pressure, electrical conductivity, and turbidity. 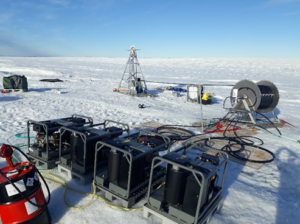 Carrying out these experiments and installing these probes is always something of a race against time because boreholes close rapidly as a result of the combined effects of deformation and refreezing, both of which are rather extreme on Store Glacier. Nonetheless, in 2018 we managed to drill four boreholes to the bed, all of which connected hydraulically and were used for logging and/or to install sensor strings.